Good mews! Chiang Mai has a pet cafe where you can get your cat crazies on. It’s one of the great debates of the ages: They say you’re either a cat person or you’re a dog person. Growing up, my family had both, and I don't claim to be biased towards one or the other. Oh, who am I kidding? I get dewy, giant-pupiled anime eyes when I see a basket full of kittens, and when it comes to having a pet at home, I prefer the company of a cat. Wally and I have two cats with decidedly different personalities: an antisocial but beautiful calico named Caribou and a sweet gray and white one who is perpetually hungry by the name of Bowzer. If we didn't live in the city, we would probably (definitely) have more. As we knew we’d be missing our beloved animal companions, Catmosphere Cat Café pawed its way onto our list of things to see and do while in Chiang Mai, Thailand. I mean, where else can you can sit and enjoy a coffee, and at the same time play with or stroke some cats?! The Catmosphere we visited is located on Huay Kaew Road, but it’s situated in a plaza of shops that sit a short distance from the road. We might have walked right past it had I not spotted the sign. When we got closer, we admired the fun marquee lights above the entrance. Before entering, we were asked to wash our hands and remove our sandals. There’s a rack to stash your footwear, and they provide colorful quilted slippers to wear inside. Choosing a time to visit the café can be a gamble, as cats are unpredictable, and in those few hours each day when they aren’t sleeping, can be bundles of spastic energy. According to the Catmosphere website, it’s best to visit either early in the morning when they first open, or in the evening. After all, cats are nocturnal creatures. On our evening visit, some slept, some were curious, and some chose to observe from afar. One of the most playful resident cats, Eve, skittered across the room in pursuit of something we couldn’t see. Wally nicknamed a docile Scottish fold sitting on a cushion across from us “the Duchess,” who after a particularly thorough grooming session fell fast asleep, half sitting up. We found out later from one of the owners that she is actually a he named Luke. A modern cat tower featuring different levels of rectangular white boxes faces the café window and is the perfect place for the kitties to hide, climb, take a catnap, or perch and observe the world beyond. For those felines looking for a quick escape route, a tri-level wall mounted variation of the tower functions as the perfect getaway. A white cat named Elsa decided to commandeer this as her lookout point, and when another cat joined her, she chased the interloper away. How’s the coffee, you ask? 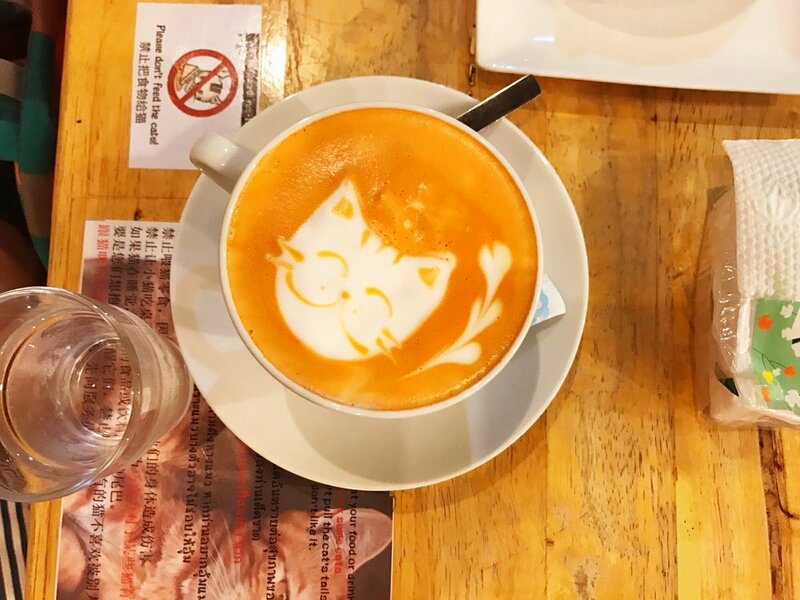 Catmosphere serves a full range of coffee drinks and desserts. Wally ordered an iced latte, which was 95 baht, or about $2.75, and I ordered a Thai iced tea (80 baht or $2.35) — I’m a cheap date and will always go for a mix of black tea, spices, sugar, sweetened condensed milk and evaporated milk. As long as you order something from their menu, entry is to the café is free. If you’re simply craving a feline fix, a fee of 100 baht (or $3 at the exchange rate at the time) per hour will be charged. All proceeds benefit the care of the resident Catstronauts. I read the laminated list of rules sitting atop our table. One suggested keeping an eye on your food and drink. A young woman who had ordered a delicious-looking slice of cheesecake left her table to photograph a few of the cats. It was then that I noticed one of the cats balanced on the table’s edge, licking the blueberry glaze off said slice of cheesecake, until one of the young female employees noticed and shooed them away. The café sells an assortment of souvenir items including tote bags and T-shirts. We purchased a tote with an illustrated portrait six of the resident cats. The experience was truly unique and we met a menagerie of cats, including Apollo, Athena, Blue, Cooper, Eve, Letty, Luke and Yoda. 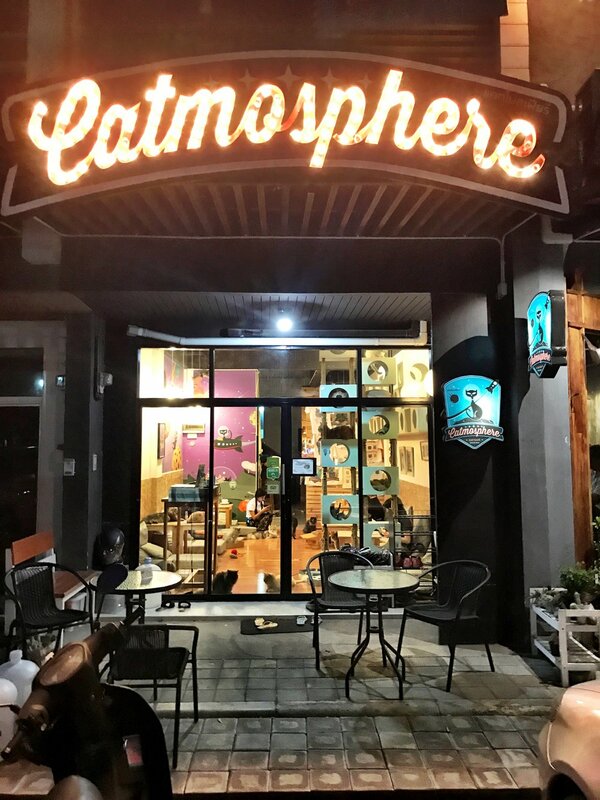 We reached out to Ben, one of the owners of Catmosphere in Chiang Mai, to ask him some questions about the coffeeshop. Curiosity killed the cat, they say, but it hasn’t harmed Wally or me yet. When did this location open? Well, for one not many people know that cats have actually been to space! The credit always goes to dogs and monkeys, which is clearly unfair. Our café is a tribute to all those brave cats who have dedicated their lives to space exploration. Seriously though, we think that it is a fun concept. We are basing it on mid-20th century space exploration and science fiction themes. There’s a lot of creative potential in that, and it allows us to do fun, tongue-in-cheek stuff. It’s cheesy, but in a good way. Are the cats adopted from shelters or are they purchased? It’s a mix of both. In the beginning, we purchased cats, but since we opened we have chosen to adopt cats instead, because homeless kittens are available all the time in Chiang Mai. Are apartments and condominiums pet friendly in Chiang Mai? Pets are forbidden in most condos. I used to rent a condo before, and we always had to smuggle the cats in and out in boxes, hoping they wouldn’t meow at the reception. The Catstronauts of Catmosphere. How many can you spot on your visit? Any funny stories you could share about the cats’ personalities? Yoda waits for the first batch of customers in the morning to go on each person’s lap and give them a cat massage. But he never gives one to Nhoon or me. Eve loves sneaking out to the street specifically to annoy us. She is incredibly good at it — she’ll wait far away at the side of the door and pretend to be busy, then once the door opens, escape efficiently and silently, in a straight line between the customer's legs. Sometimes, nobody notices that she’s gone until she’s at the door half an hour later. Letty shows her love by gently biting people on the nose. Every time a new plaything or other item arrives, Apollo takes first ownership of it, usually by lying on it or rubbing his cheek on it. After a day or so, it is then made available to the other cats. Athena likes to randomly jump on customers’ tables from above and spill the coffee.